LMU researchers have monitored how epigenetic information is transmitted to daughter cells during cell division and determined when the cell’s developmental memory is re-established. Every cell in the body starts out with the same complement of DNA and is equipped with all of the genetic information present in the nucleus of the fertilized egg. The diverse cell types that make up multicellular organisms differ in their structure and function because each makes use of only a subset of the information encoded in the nuclear genome. 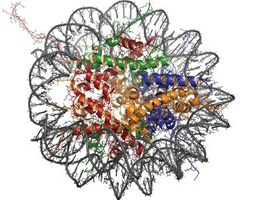 Proteins called histones serve as scaffolds for the packaging of nuclear DNA molecules into ‘chromatin’, the nucleoprotein complexes that become visible as condensed chromosomes prior to cell division. However, histones also play an active role in determining which subset of nuclear genes is expressed in each differentiated cell type. This differential packaging involves the chemical modification of histones by the attachment of methyl (CH3) or acetyl (CH3COO-) at specific target sites. These modifications in turn regulate the accessibility of stretches of the chromosomal DNA to the enzymes required for gene expression. Histone methylation often represses gene expression, while acetylation activates it. A team of researchers led by Professor Axel Imhof at LMU‘s Adolf Butenandt Institute has now tackled the question of how the pattern of histone modification present in a cell is passed onto its daughter cells during cell division. The team reports the results of the study in the journal “Genes & Development”. To ensure that daughter cells express the same genetic program as their progenitors, newly synthesized histones must be modified in precisely the same way as those present in the mother cell prior to cell division. “In order to comprehend how cancers originate, we have to understand this mechanism of cellular memory, but so far little is known about how it operates,” says Imhof. The LMU researchers used chemical precursors containing heavy isotopes to label the new histones deposited on specific stretches of the genomic DNA, enabling them to be distinguished from the parental histones by means of mass spectroscopy. In this way, the team was able to determine how and when during the cell cycle the new histones acquired the set of modifications present in their parental counterparts, and thus determine when the cell’s epigenetic memory is re-established. This result has important implications for tumor research. “Failure to transmit histone modifications plays an important role in the loss of epigenetic information that could lead to a dedifferentiation that is characteristic of tumors,” says Imhof. In effect, tumor cells no longer ‘remember’ the type of differentiated cell lineage to which they previously belonged. As a result of this loss of cellular memory, they divide in an unregulated fashion, and proliferate so fast that they can invade and disrupt neighboring tissues, endangering the survival of the organism. Conversely, embryonic stem cells possess the capacity to differentiate into many different cell types, but they also divide very rapidly. However, their ability to produce diverse cell types implies that they can reconfigure (and selectively ‘forget’) the pre-existing pattern of histone modifications in their chromosomes during cell division. “In the ordered succession of cell differentiation that occurs during normal embryonic development, changes in histone modification play a very important role,” says Imhof. Stem cell researchers are currently trying to understand the innate flexibility of these cells, and exploit it for therapeutic purposes. Thus it is possible to convert adult cells into pluripotent stem cells, which can be persuaded to differentiate into various cell types. “The problem is that the process is very inefficient,” Imhof remarks. He and his colleagues now hope to identify inhibitors that block the action of the enzymes responsible for histone modification, as such agents should facilitate the targeted reprogramming of cells.